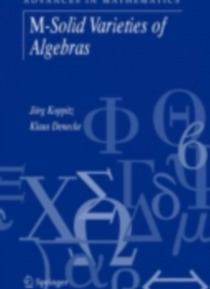 M-Solid Varieties of Algebras provides a complete and systematic introduction to the fundamentals of the hyperequational theory of universal algebra, offering the newest results on M-solid varieties of semirings and semigroups. The book aims to develop the theory of M-solid varieties as a system of mathematical discourse that is�applicable in several concrete situations. It applies the general the… ory�to two classes of algebraic structures, semigroups and semirings. Both these varieties and their subvarieties play an important role in computer science.A unique feature of this book is the use of Galois connections to integrate different topics. Galois connections form the abstract framework not only for classical and modern Galois theory, involving groups, fields and rings, but also for many other algebraic, topological, ordertheoretical, categorical and logical theories. This concept is used throughout the whole book, along with�the related topics of closure operators, complete lattices, Galois closed subrelations and conjugate pairs of completely additive closure operators.